Jay is a born and bred Somerset boy and had moved to my hometown in Essex just weeks before we met. At the time we were both working in local tattoo studios and I’d gone to where he worked to book in. Everything is just so chilled and easy, nothing is a chore and Jay supports me whole-heartedly and always encourages me to be free and do what makes me happy. He’s the life of the party and we have an unreal group of friends and family. We are both surrounded by a lot of love and feel so lucky. We both live and work in Essex now. I work in a tattoo studio really close home, Jay has a business of his own alongside a whole list of crazy hobbies to keep him busy and when we’ve had enough we escape to visit his family on Somerset or to my dads caravan in Kent. My day to day look is very relaxed, mostly band tee shirts with baggy jeans or leather trousers. If I could get away with wear my pjs to work I would although I do love any excuse to get really dressed up and put on some heels. I’m really into high fashion looks with anything oversized and I love mixing textures and layering. I found my wedding dress with the help of Katy Headley at Ghost Orchid in Hessle. 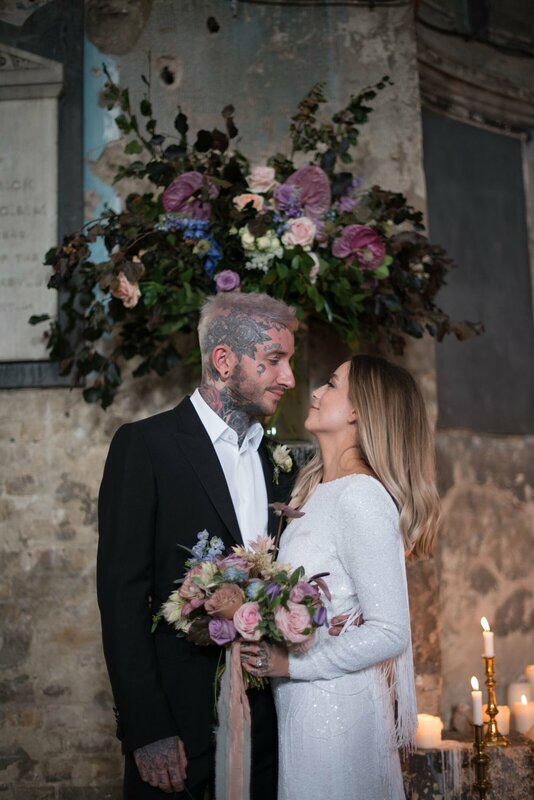 I knew I wanted to steer away from classic bridal it was also important for me to have a long sleeve dress to cover my tattoos because I feel really under dressed with them on show. The Meghan dress was actually the first gown I tried on and I knew right away. The fact that I could customize the back with the fringe was a deal breaker and got the most compliments on the day. 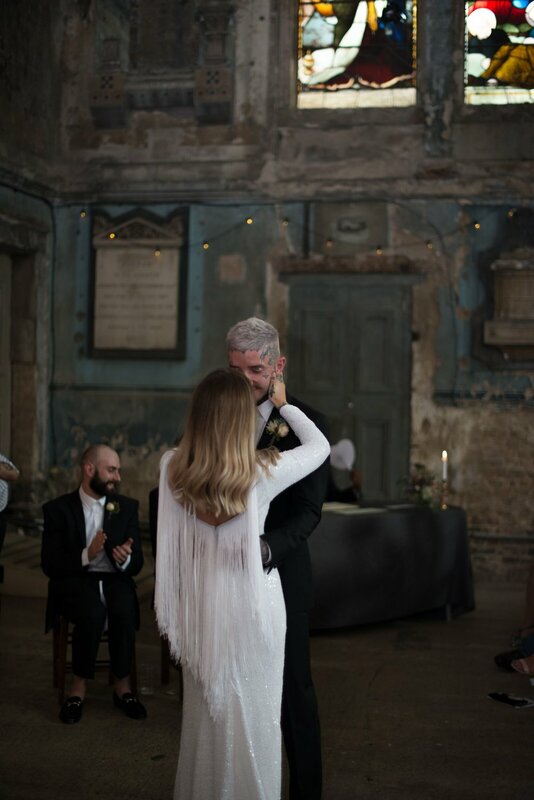 Our wedding vibe was heavily influenced by our love for religious renaissance and Baz Lurhmans Romeo+Juliet movie. The initial idea was to do a classic kitsch Las Vegas day but we’re both so close to our families and worried it would have been a regret not to have everyone there on the day. With that we settled on a casual/informal setting in London. Fave thing about your day? We scrapped a lot of the traditional post wedding stuff, we just wanted to unwind and party with everyone. Food by Lucky Chip burgers was passed around at intervals throughout the night to keep everyone going rather than a seated meal and my dad gave our only speech later on after a lot of tequila shots. 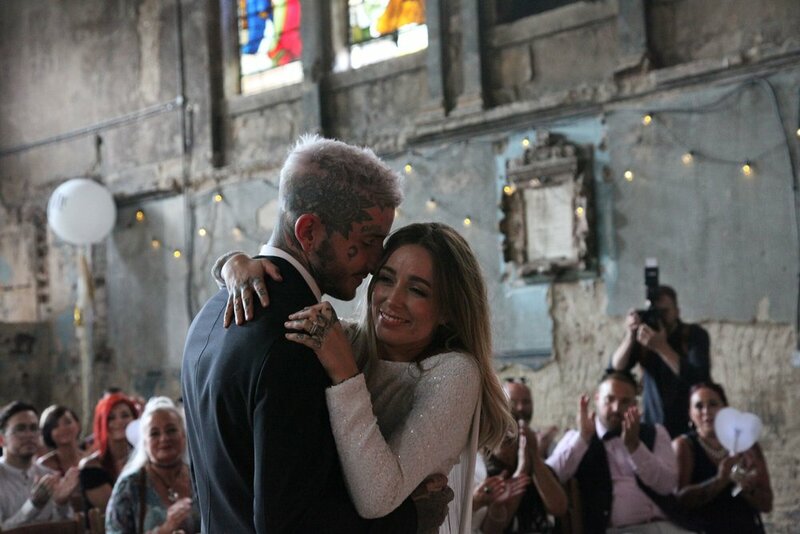 Having all our friends and family together celebrating with us was the best bit. Marriage to me is about support and teamwork. Growing together, making mistakes and learning from them, my relationship with Jay has been one huge learning curve. We’ve both taught each other so much about ourselves, he knows me better than I do! It’s important to scrap the idea of a fairytale relationship and be open to take on challenges together. My advice to future brides would be to take everything in your stride. Things might not completely go as planned but everything happens for a reason, remember what you’re here for and relax. Don’t let the stress of planning steer you away from why you’re doing it. It’s still so surreal! I don’t feel like a wife but what’s supposed to change? We’ve been together for 7 years, 6 of them living together and two engaged so in my mind I’d already adjusted. We went straight onto our honeymoon the week after the wedding. For the first time since we’ve been together we totally switched off from life at home which was great and very hard to come back down from cloud nine on our return home.